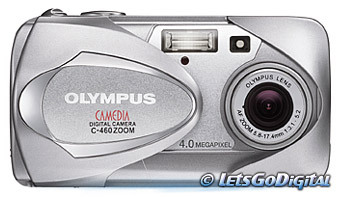 The new 4 Megapixel entry level model, the C-460ZOOM of Olympus is one of the many models Olympus introduces during the PMA 2004 show in Las Vegas. This compact zoom camera is equipped with an resolution of 4 million pixels, an optimised image processing system and a 3x optical zoom. The camera has a short shutter release time lag, handy for quick shooting, but is also capable of producing sharp, rich contrast and high colour saturation prints. The C-460Zoom distinguishes itself by its enhanced user's friendliness and a large number of handy functions like the Super Macro function that lets you approach a subject as close as 7cm, and it features a Movie clip function with sound. The five built-in Scene Programs let the camera function uncomplicated under most circumstances. The Landscape setting for example is ideal to make impressive holiday pictures, while Night view can be set to capture the beautiful sunset on the seaside. Beside the possibility of capturing still images the C-460ZOOM can also record moving images with sound. Naturally digital technology makes it a lot easier to share special moments with others in a simple way. Images and video clips can be transferred onto a computer without a problem and then mailed to family or friends. Also printing has been made easier, the camera supports PictBridge communication standard therefore images can be printed without the interference of a computer. Just connect your camera onto a PictBridge compatible printer like the CAMEDIA P-10 and surprise yourself with beautiful laminated and astonishing real life prints. The C-460 offers user's convenience, a fine compact design and of course high quality images, all of this for an affordable price. This new model will be available in March 2004.